* Also exists for all brands. Until our next update, the Samsung Galaxy J6 Plus, Galaxy J4 Plus and Galaxy S9 (a phablet) are our selection for best Samsung phones. Considering this phone's aggregate rank of 90%, we are confident that the Samsung Galaxy J6+ is currently Phonerated's best Samsung phone 2019. Furthermore, we think that our 44 reviews sampled from our sources give us a high confidence level that pushes us to label it a "no-brainer best choice." The 2018 Samsung Galaxy J6 Plus is a wide-screen smartphone for the budget-cautious, listing a 6-inch 18.5:9 display, a 512GB microSD card slot (It has 64GB/32GB of on-board storage), and a dual camera among its specs. With its star rating of 4.5 computed from 47 reviews, we rank this Samsung model second best Samsung phone. * This list is based on an in-depth analysis of hundreds of reviews from multiple sources. The Samsung Galaxy J4 Plus is a budget-tier smartphone whose biggest specs include a 32GB maximum internal memory expandable by up to 512GB, a 6-inch 18.5:9 HD+ display, and a respectable 3300mAh raw power capacity. Don't Choose The Wrong Samsung Phone! Let Us Find Your Perfect Phone! Question #1: Should it be a smartphone or not? B) Regular, "dumb" phone only. No smartphones please! The Samsung Galaxy S9 is one of Samsung's two MWC 2018 entries that skirt ultra-high-end smartphone territory with specs like a 5.8-inch 18.5:9 570ppi display, a 12-megapixel Dual Pixel cam with Super Slow-mo (960fps), and an eight-core chip clocked at 2.8GHz + 1.7GHz. The Samsung Galaxy S9 Plus is an enlarged version of Samsung's flagship S9 smartphone whose specs include a 6.2-inch 18.5:9 1440p screen, a dual 12-megapixel camera with Super Slow-mo and Dual Aperture Mode, and a 2.8GHz + 1.7GHz octa-core engine. The Samsung Galaxy S10e, though a watered-down version of the S10, is nevertheless a high-end smartphone, offering specs like a triple-cluster eight-core engine peaking at 2.84GHz, 8GB of RAM, and an on-display 10-megapixel selfie cam. The Samsung Galaxy A8 Plus 2018 makes for a solid high-end phablet contender, with specs like a 6-inch 18.5:9 FHD+ (2220 x 1080) screen, a 2.2GHz + 1.6GHz eight-core processor, and a 16-megapixel + 8-megapixel dual-lens selfie cam in its arsenal. The Samsung Galaxy J7 2018 is a middle-class 5.5-inch smartphone rigged with specs like a 13-megapixel selfie camera, a 3300mAh battery promising up to 20 hours of continuous video playback, and a 1.6GHz octa-core processor. 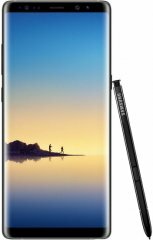 The Galaxy Note8 threatens a lot of already-established premium smartphones with a 6.3-inch WQHD+ (2960 x 1440) Infinite Display, 6GB of RAM (eight-core 10nm CPU), and Samsung's own Bixby voice assistant leading its specs. The Samsung Galaxy A7 2018 is an imaging-first smartphone whose key specs include a triple-lens main camera, a highly-competitive 24-megapixel selfie cam, and an Exynos 7885 engine clocked at 2.2GHz (top speed). The Samsung Galaxy J7 Pro hopes that its combo of a 3600mAh battery and two 13-megapixel cameras is enough to convince the phone photography-loving crowd, and at the same time, to potentially distract from its less-than-impressive 1.6GHz processor specs.